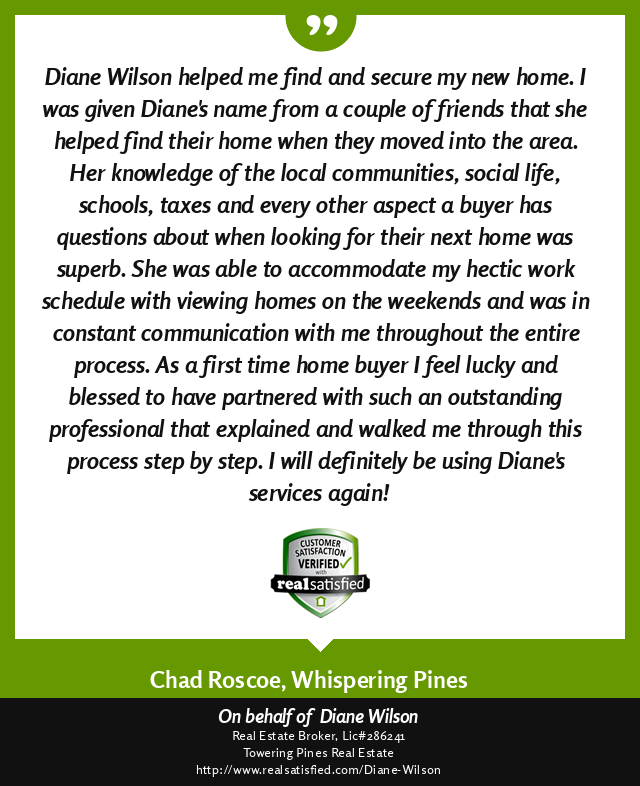 Another happy client for Diane Wilson of www.DianeWilsonProperties.com! "Diane Wilson helped me find and secure my new home. I was given Diane's name from a couple of friends that she helped find their home when they moved into the area. Her knowledge of the local communities, social life, school, taxes and every other aspect a buyer has questions about when looking for their next home was superb. She was able to accomodate my hectic work schedule with viewing homes on the weekends and was in constant communication with me throughout the entire process. As a first time home buyer I feel lucky and blessed to have partnered with such an outstanding professional that explained and walked me through this process step by step. I will definitely use Diane's services again!" - Chad Roscoe, Whispering Pines.